Kilts for men are arguably the most comfortable garment any man could imagine, or hope to wear. This is only one reason amongst many which I will cover, as to why the kilt is gaining in popularity with men around the world. The kilt is of course the National Dress of Scotland, and has been a Scottish icon for many years. Ask almost anyone to name two things they associate with Scotland, and I guarantee the kilt will be one of the two things they will mention. It is now being discovered, and worn by men in many different countries, both those with Celtic heritage, and those who simply want to experience comfort, and a sense of freedom. Kilts for men were first exclusively worn by the clansmen of the Scottish Highlands, as far back as the sixteenth century. If you would like to read about the history of Scottish kilts, you will discover their origins, and see how they evolved into the kilt we know today. It is often said that real men wear kilts, and this statement is absolutely true, as it takes a certain amount of courage to wear a kilt in public for the first time. 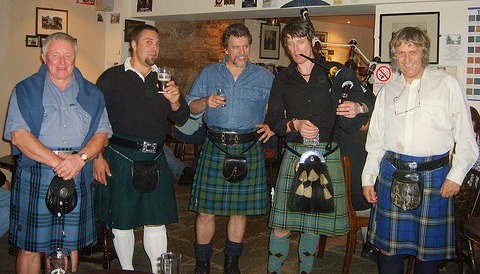 The Gentlemen in the next photo certainly don't lack courage when it comes to wearing their kilts, in fact they are all seasoned kilt wearers, and can be seen relaxing in the company of a piper. If you have ever experienced the discomfort of trousers (pants) as you sit or crouch in them (and which man hasn't) then I encourage you to try a kilt. You will not believe the comfort and freedom of movement that you get from a kilt, but once you do, you will want to wear your kilt as often as possible. I am forever reading accounts of men who have totally discarded trousers in favour of wearing kilts on a daily basis. Do I wear my kilt every day? No unfortunately I don't, but I certainly wear it as often as the opportunity presents itself. Kilts for men are no longer just traditional Highland Dress, worn at weddings and other special occasions. They have evolved, and nowadays are not only made from wool, but also a variety of other fabrics, which include denim, canvas, and even leather. In fact if you look at the next photo you will see center left a young man wearing a leather kilt. The group stopped to have their photo taken before embarking on the Kilt Walk, a charity event which takes place in Edinburgh. contemporary kilts are becoming very big, and men are now wearing kilts to concerts, clubs and even the movies. Another reason that I hear from men, as to why they love to wear the kilt, is that women simply adore men in kilts. They find them incredibly masculine, and alluring, and of course the question as to what is being worn under it, often pops into their mind. Now of course what you wear under your kilt is entirely up to you. It is true (as you will know, if you followed the last link) that Scottish soldiers don't wear underwear beneath their kilts, and this tradition has found its way into the civilian population of Scotland. I personally have never, and would never wear anything beneath my kilt, as it is so comfortable without. But if you would feel more comfortable wearing underwear then do so, just like the tartan you choose for your kilt, the choice is yours, and yours alone. 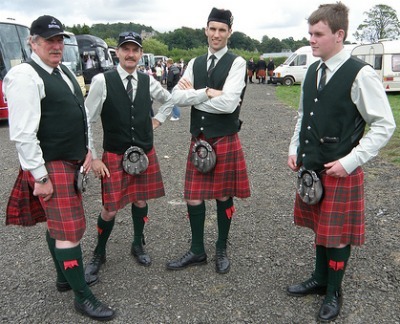 I mention tartan as there is another common misconception associated with kilts for men, and that is that you must have a family connection to a clan, in order to wear a clan tartan. I would like to make the point very clear, that this is simply not true. You may wear any tartan you wish, as there are no laws governing the wearing of tartan, despite what many traditionalists would have you believe. What I would add though, is that having decided on the tartan for your kilt, you then research it a little, so that when asked about it, you can give an authoritative answer. And then wear it with the pride it deserves. If you have ever wondered what it would be like to wear a kilt, then I strongly urge you to go along to your nearest kilt maker, and hire one for the day, or weekend, before deciding to buy one. As ever, if you have any questions about kilts for men, or any other kilt related matter, do drop me a line using the Contact Us page, and I will do my best to help.